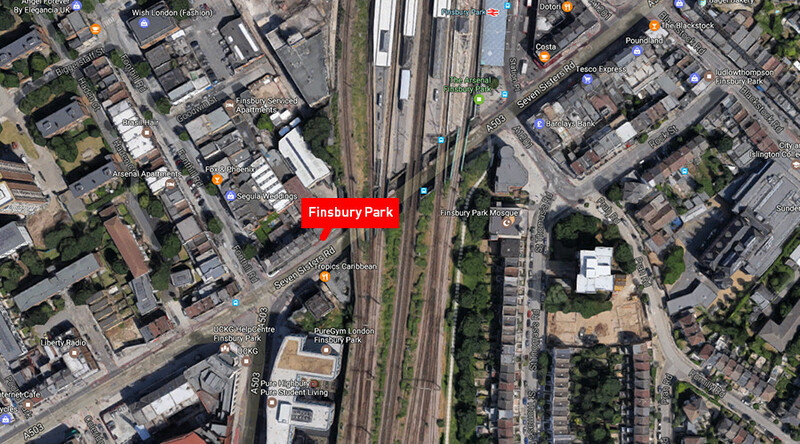 At least one dead and 10 injured are reported in London’s Finsbury Park, where a vehicle drove into pedestrians, many of whom are believed to be Muslims coming out of the local mosque after prayers. Police have arrested one person and ambulances are on the scene. The man who died is believed to have been an elderly worshipper who was already receiving first aid from members of the public after collapsing. It is not known if his death was caused by the attack, police said. London’s Metropolitan Police said in a statement that “there are a number of casualties being worked on at the scene” of the apparent attack, which took place at Seven Sisters Road. A white van ploughed into people outside the Muslim Welfare House, close to the Finsbury Park Mosque. The suspected attacker has been described as a white male, and is seen being arrested in an eyewitness video. Police did not immediately disclose his identity, only revealing that he is 48 years old. A witness of the attack told Ruptly’s producer Jon Scammell that many of the people were “crushed … while they were having their coffee.” It coincided with the time of the night when Muslims are breaking their fast during the holy month of Ramadan. Videos showing the aftermath of the incident emerged on social media, in which several people could be seen lying motionless on the ground. Twitter user Didier, who says he was at the scene at the time the incident unfolded, posted a video showing the arrest of a suspected attacker by police. Didier wrote that he saw at least seven people injured as a result of the attack, including three of them seriously. Before the police arrived at the scene, bystanders reportedly apprehended the alleged attacker and pinned him to the ground. A van has literally ran over Muslims on their way back from prayer in #FinsburyPark. What is happening to London. Some eyewitnesses report that the driver veered off the road into the crowd on purpose. The van “slowly and intentionally accelerated into a crowded cafe outside a mosque,” LBC cited an eyewitness as saying. 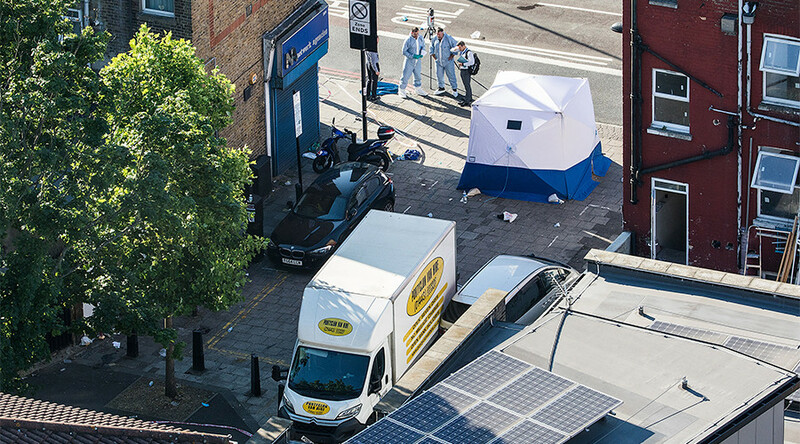 Police have, however, denied unconfirmed reports cited by the Evening Standard that a man wielding a knife came out of the van after it mounted the pavement and stabbed at least one person. Armed police arrived at the scene and inspected the van used in the attack. The scene has been cordoned off. Mohammed Kozbar, the chairman of Finsbury Park mosque, located 300 meters from the cite of the attack, told RT he believes it was deliberate and should be treated as a terrorist attack. “We have to condemn this incident regardless who is behind it and call it as it is – it is a terrorist attack on innocent people,” Kozbar said, comparing it to the recent terrorist attacks in Manchester, Westminster and London Bridge. The London Fire Brigade reported that they are assisting the police and ambulance services in dealing with the incident. Labour Party leader Jeremy Corbyn tweeted he was “totally shocked at the incident at Finsbury Park tonight,” adding that his thoughts were “with those in the community affected by this awful event.” Corbyn has been the MP for the Islington North constituency, which includes Finsbury Park Mosque, since 1983. Corbyn attended the mosque on Wednesday, June 14, for an annual Iftar ceremony with other local community leaders, including Christian and Jewish religious leaders, peace campaigners and a representative of the Metropolitan police. “All my thoughts are with those who have been injured, their loved ones, and the emergency services on the scene,” May said.